The Residences at The Stanley Hotel offer a convenient, quiet vacation near Rocky Mountain National Park. During the day, these beautiful Estes Park vacation rentals provide a safe place for children to run around and play. At night, they become a stargazer’s haven with clear views of the Milky Way. Only a five-minute walk from Safeway and The Stanley Village, evenings can be spent taking moonlit walks downtown to the local bars and restaurants. Experience wildlife right out your front door with elk, deer, chipmunks, rabbits, and an occasional bear stopping by to say hello. 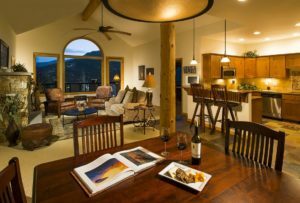 Just a 15-minute walk from the Gem Lake and Black Canyon trailheads, you are in a prime location for outdoor adventure, plus Long’s Peak and other mountain vistas are only a short drive away. During the summer, a free shuttle service is available to take you around town and into the national park, with drop-off and pick-up conveniently located at The Stanley Hotel. Our condos include all the amenities you’ll need to feel right at home, which makes it an ideal destination for families, couples, and large groups.